Everyone has their own way of making a PB&J, but not everyone runs one of the 21 best sandwich shops in America. To find out how a pro crafts the simplest of all sandwiches, we asked John Bates from Noble Sandwich Co., known for genre-bending creations like duck pastrami, to share some between-the-bread expertise. Read on for his recipe, which includes gratuitous quantities of PB and J, plus a sprinkle of a super-secret ingredient that you definitely have in your kitchen (okay fine: it's sea salt). Choose your favorite organic peanut butter (or almond, which the chef prefers). It's best if you can grind it yourself at the store. Refrigerate the jam for at least 2 hours, as you want it to be nice and cold. Spoon the peanut butter evenly on the bread. Spread it right up to the edge. Sprinkle the sea salt on top of the peanut butter. 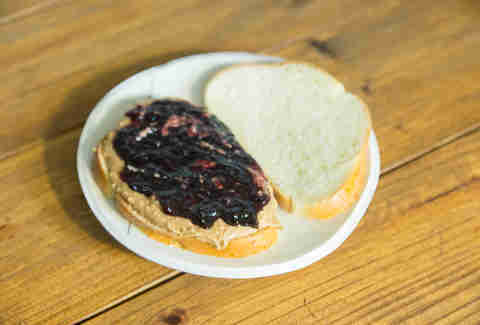 Spoon the berry jam onto the peanut butter. With the back of the spoon, evenly spread the jam across the sandwich to the edge. Top it off and eat immediately. You don't want the bread going stale as it sits out. Dan Gentile is a staff writer on Thrillist's National Food and Drink team. 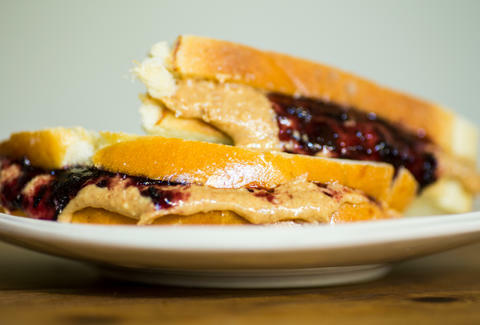 His perfect peanut butter and jelly will always feature crunchy peanut butter. Follow him to hilarious JIFs at @Dannosphere.